Doppler, also known as Amazon Tower I, and Rufus 2.0 Block 14, is a 524-foot-tall (160 m) office building in Seattle, Washington that houses the corporate headquarters of Amazon.com. 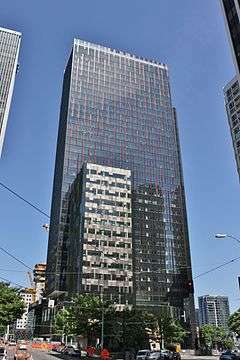 It is part of the three-tower campus that Amazon is developing in the Denny Triangle neighborhood, located at the intersection of Westlake Avenue and 7th Avenue near the Westlake Center and McGraw Square. The tower houses 3,800 employees. The Amazon campus, designed by Seattle architecture firm NBBJ, was approved by the Seattle Department of Planning and Development in late 2012 and excavation on Tower I began under the direction of Sellen Construction in June 2013. The tower was topped out in February 2015 and opened on December 14, 2015. The 37-story building also has a five-story meeting room center, featuring an amphitheater and stage with stadium-style seating for 2,000, and six stories of underground parking with 1,064 spaces; there is also retail space at the ground level leased out to shops and restaurants, including a Starbucks, Skillet Street Food, Marination, Mamoon, Anar, Potbelly Sandwich Shop, Cinque Terre Ristorante, and two restaurants from local chef Josh Henderson. The project, covering the entire three-block campus, is also on track to receive LEED Gold certification. The facade uses dichroic glass to reflect light in varying colors dependent on the time of the day. The tower's name, Doppler, refers to the internal codename of the Amazon Echo voice-controlled speaker that launched in 2014. The site was once proposed for a 31-story mixed-use high-rise, known as the Seventh at Westlake Tower, that was canceled in 2012 after being on hold for four years. 1 2 3 "Beam Me Up, Rufus! Block 14 Tops Out". Sellen Construction. February 25, 2015. Retrieved December 10, 2015. 1 2 Demmitt, Jacob (December 14, 2015). "Amazon launches new era with opening of first tower at new Seattle campus". GeekWire. Retrieved December 14, 2015. 1 2 "Amazon Tower I". CTBUH Skyscraper Database. 1 2 "Construction Updates for Blocks 14, 19 & 20". Sellen Construction. Retrieved August 8, 2015. ↑ Demmitt, Jacob (December 4, 2015). "Amazon to begin move into new Seattle campus next week, with rooftop dog park and indoor basketball court". GeekWire. Retrieved December 5, 2015. ↑ "Amazon's artsy, amenity-packed tower marks a reshaped neighborhood". The Seattle Times. 7 May 2016. Retrieved 15 October 2016. ↑ González, Ángel (May 7, 2016). "Amazon's artsy, amenity-packed tower marks a reshaped neighborhood". The Seattle Times. Retrieved September 20, 2016. 1 2 "Amazon at Denny Triangle: Work Global, Live Local". NBBJ. Retrieved August 8, 2015. ↑ Cohen, Aubrey (November 30, 2012). "Seattle OKs Amazon towers". Seattle Post-Intelligencer. Retrieved August 8, 2015. ↑ Pryne, Eric (February 14, 2013). "Excavation for first Amazon tower to begin in June". The Seattle Times. Retrieved August 8, 2015. 1 2 Stiles, Marc (December 5, 2012). "Amazon: Sellen will build first phase of downtown Seattle campus". Puget Sound Business Journal. Retrieved August 8, 2015. ↑ Milne, Stefan (May 24, 2016). "Cinque Terre Ristorante Opens June 8". Seattle Met. Retrieved November 13, 2016. ↑ Johnson, Kirk; Wingfield, Nick (August 25, 2013). "As Amazon Stretches, Seattle's Downtown Is Reshaped". The New York Times. Retrieved August 8, 2015. ↑ Stiles, Marc (December 14, 2015). "To feed the masses at its first tower, Amazon goes local". Puget Sound Business Journal. Retrieved December 14, 2015. ↑ Group, Sinclair Broadcast. "Why foodies should pay attention to Amazon's Doppler building". Seattle Refined. Retrieved 2016-05-07. ↑ Khaikin, Lital (June 9, 2013). "Amazon's New Seattle Office Aiming For LEED Gold Status". Ecopedia.com. Retrieved August 8, 2015. ↑ Martin, Kate (September 20, 2016). "What do you think? Tacoma convention center hotel developer offers first look, delays project". The News Tribune. Tacoma, Washington. Retrieved September 20, 2016. ↑ Greene, Jay (December 14, 2015). "Workers move in to the first of Amazon's downtown towers". The Seattle Times. Retrieved December 14, 2015. ↑ "Permit & Complaint Status: 2017 7th Avenue". Seattle Department of Planning and Development. March 7, 2012. Retrieved August 8, 2015. ↑ Pryne, Eric (February 29, 2008). "Downtown Seattle hotel-condo project put on hold". The Seattle Times. Retrieved December 14, 2015.